Eric Clapton loves Ferrari. Ferrari loves Eric Clapton (and his money). The result? This amazing and one-of-one possibly V12-powered custom Ferrari 458 Italia designed to look like the Ferrari 512 Boxer. 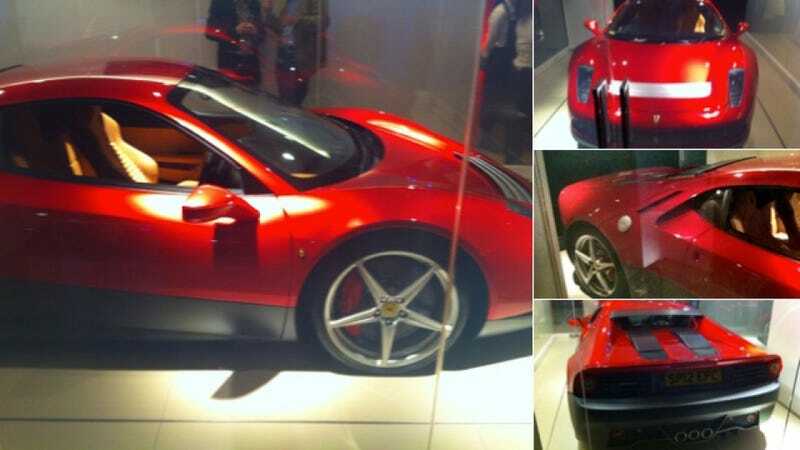 It's called the Ferrari SP12 and it debuted last night at a chic London exotic car dealership. Here's what we know about it. UPDATE! There have been rumors of a custom Ferrari-built model for Clapton involving a Ferrari 458 Italia fitted with a V12 engine for some time. Ferrari occasionally does this, but these projects are enormously expensive one-offs for Ferrari's best customers. One-Off Modernized Pininfarina Ferrari 410 Superamerica Hiding In Italy? Last night at H.R. Owen, Clapton himself was apparently on hand to see the reveal of his car, probably called the Ferrari SP12. The dealership's own Twitter account retweeted a post identifying the car as a V12 (although we don't yet know if it's the 599 or FF/F12's engine or just more rumormongering). More proof of Clapton's ownership are these shots from PistonHeads that show the license plate "SP12 EPC" as in Special Projects V12 Eric Patrick Clapton (or possible Special Projects #12, leaving a few out there to find). Here's some video of it from Schmee150. As always, the enlightened crew at Ferrari Chat are all over this car, which they properly identify as an homage to the Ferrari 512 Boxer with a Boxer-like rear deck, lower trim, and are those Enzo headlights? Interesting. All the details will be revealed in a future issue of the Ferrari Magazine, which will hopefully be leaked to us before it goes out. UPDATE: Top Gear is raining on our parade and saying the car carries the 458's original V8 engine. Apparently, Clapton couldn't get Ferrari all the way down on its knees.